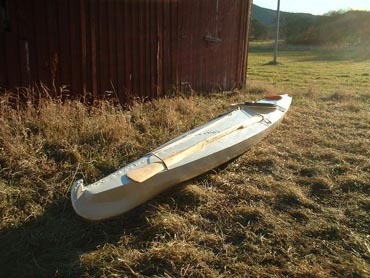 On September 19, 2003, I enjoyed the maiden voyage with the canvas kayak that I had recen tly built. I was pleasantly surprised. It lived up to all my expectations and then some. What surprised me the most was that it was neutral to sidewinds, not turning into the wind as much as my fibreglass kayak. This craft actually didn't need a rudder. It was easy to paddle and surprisingly fast. I brought a GPS and could easily maintain a speed of 4.5 knots. When I exerted myself, I could manage 6 knots. The kayak is very stable and I can lean over quite far before it starts to capsize. I padded the back of the cockpit afterwards for the sake of my back. I have two insulation mats to sit on. The sea sock was fantastic. 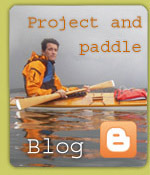 It's a wonderful invention, both when it comes to safety and for carrying items to be packed in the kayak. The canvas kayak is my first choice when I go out to paddle. The fibreglass kayak is now going into storage. Thank you very much for enjoyable, productive days that I will remember with great pleasure. I am very satisfied with the result.